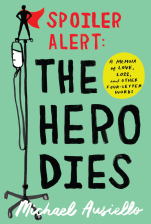 Jim Parsons (Big Bang Theory) has optioned the rights to the Michael Ausiello memoir Spoiler Alert: The Hero Dies. In his heartbreaking, tragicomic memoir, Ausiello told the story of the eleven month span between when his partner, photographer Kit Cowan, got a diagnosis of terminal cancer, and his passing. Interwoven is the story of their meeting, falling in love, and the ups and downs over 14 years.